We are immensely grateful to our many volunteers who take care of the Center and one another. Whether you are interested in traditional Japanese cultural classes or modern team building activities that are inter-generational, you will find your place here. Thank you to the organizations and clubs for making SFVJACC our home away from home. As you know, the temperature in the valley can reach 110 degrees. SFVJACC members enjoy a healthier temperature during Senior Hot Meal on Tuesdays and Fridays, or when they check out a book from the Japanese and English collection in the conference room library. It's heavenly! Bryan Branly, from Spectrum News, produced a fantastic segment about the SFVJACC. The video features the Ping Pong Club and it's members in action. Check out the video and see if you recognize anyone you know! What's going on at the SFVJACC? 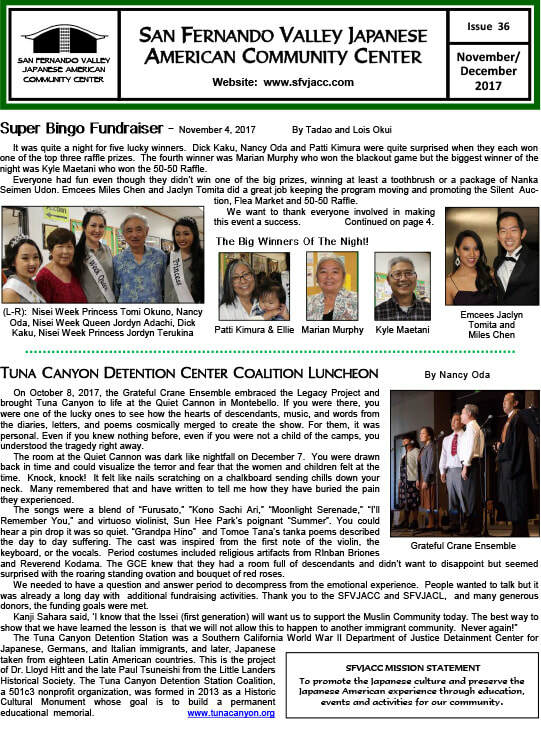 ﻿​The SFVJACC newsletter is available now! Click below to view it. The SFV Athletics Registration Form is available now. Click the button below to download it. Sign up for the SFVJACC Email Mailing list to receive emails from us regarding general community center news, scholarships, JACL, and the SFVJACC newsletter. ﻿﻿Click the button below to view the current Senior Hot Meal Program Menu. Employment opportunities in the community.